Welcome Everyone!!! I am so glad that you decided to come along on our hop! I am excited about what I have in store for you. I have pictures of a wonderful fun project I made. I want to share this with you. I must say that something special happened between when I made it and now when I am able to share this with you. Let's now get the formalities in place. If you have just stumbled upon my site because you're a follower; I am happy to have you here. I wouldn't want you to miss out on the fun that we have been having putting this together for you. 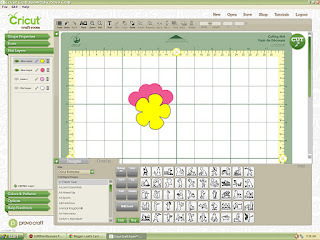 I'd like you to start with Jenny, our wonderful hostess at CrazyAboutCricut. If you have been hopping along with us and have come from Bobbi's at Rock Girl Custom Designs then you are in the right place. Thank you for coming...now on to the fun!!! Are you excited?? Ok!!! Here we go! 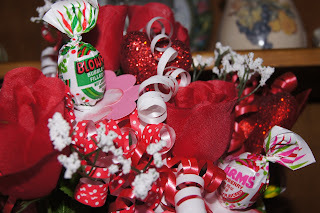 I was working with son on some lollipop flowers. We were having fun with different things. 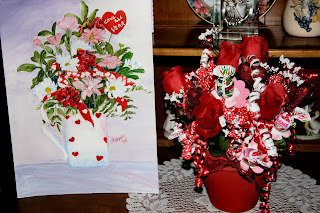 I then had him help with an arrangement we have now on our hutch in the kitchen for Valentine's Day! 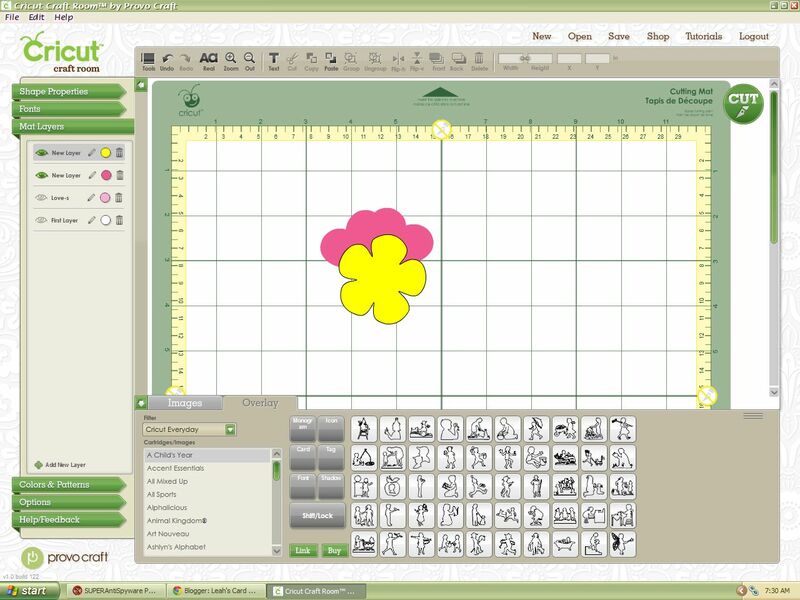 I had gone into Cricut Craft Room to make the designs to duplicate something we had seen online in a kit. I didn't want to pay the price they were asking for the kit so I looked again ~ saw that I could do this so I went on to do it. Son and I had fun putting them together. He didn't want the flowers to be just white so he asked me to ink them up so I did that. He isn't able to do this part. Here is the end result hope you like. 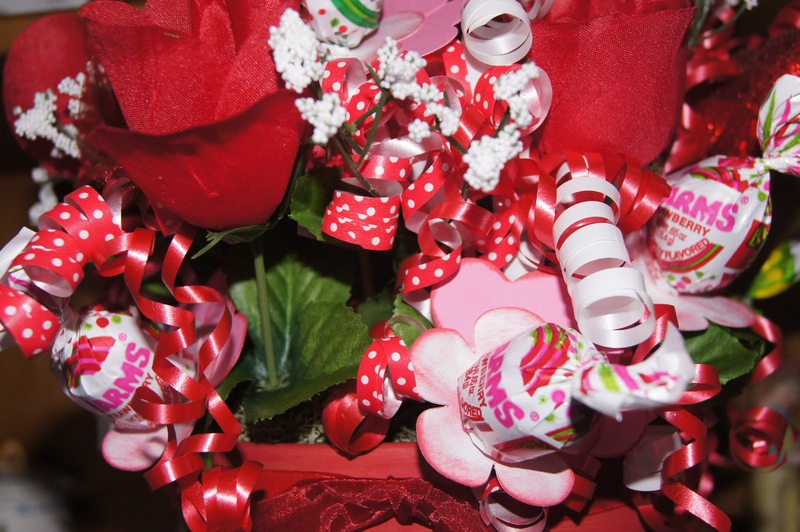 Cut your flower center at 2" plus depending upon the size of your lollipop you plan to insert into the center of the flower. Then use Home Accents Cartridge to cut your hearts at 1.4" These will be placed at the back of your flower off center so the lollipop can still be inserted through the center hole. The hearts are your leaves for your flower. Here is a surprise that I was surprised with. My Mom and Step Dad came over for a visit they brought this after seeing our arrangement. 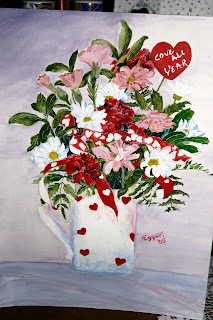 This is a painting that my Gram Gigi did before she passed away. They thought it looked alot like our arrangement. The elements in her painting are incorporated in our arrangement or very similar. Funny how God does that. I had been thinking of my Gram this week and the happy memories with her. This just tied it all together for me. Going to leave you with the picture of the lollipop screen shot then two pictures; one of our arrangement next to my Gram's picture and her picture alone. Thank you for staying. After the pictures I will give you direction to where you hop next. Thank you for stopping!!! Here you go now hop onto our talented Amber at My 3 E Scrapbooking. Enjoy the rest of the hop. 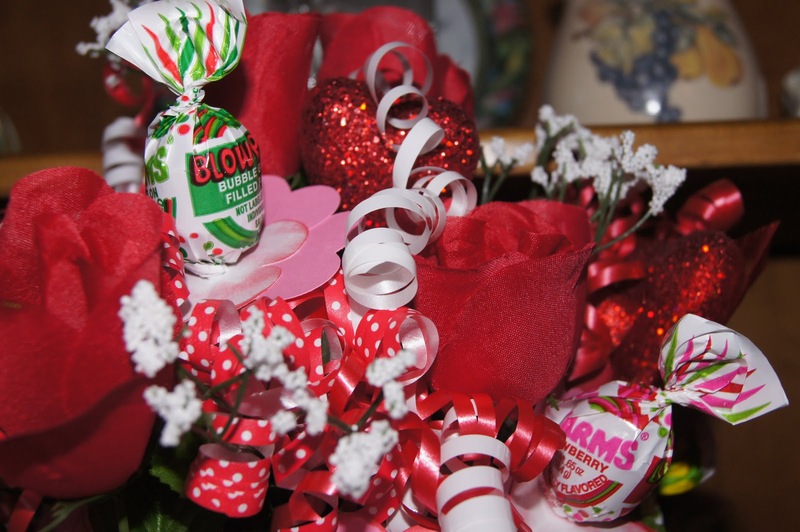 Hope we have given you some inspiration for Valentine's Day! 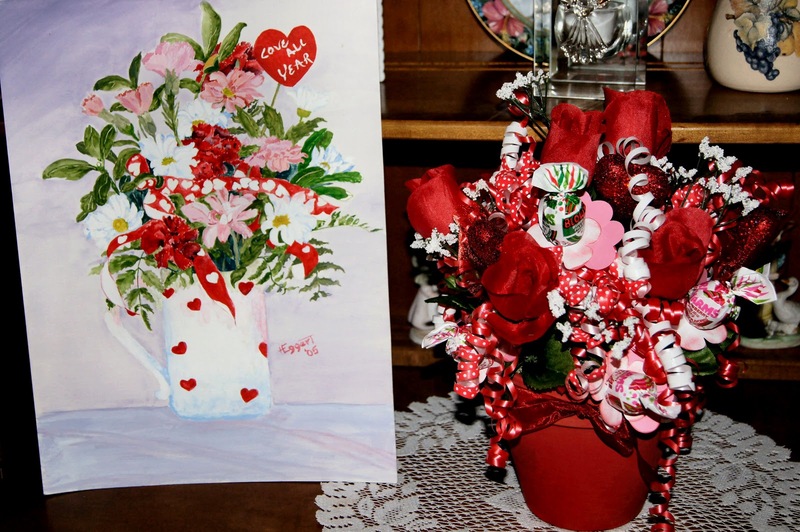 Leah~ I love how your Grandma's picture looks just like your arrangement. She must have been with you while you were making this. I love how easy this would be to make for any age. Thank you for sharing your fun project. Oh Leah I love your arrangement!! What a great centerpiece this is!!! Very pretty; such a nice floral arrangement and home decor piece! TFS!--Pat N.
Thanks for sharing such a beautiful flower project and the touching picture that went with it! It makes it sooo much more special! 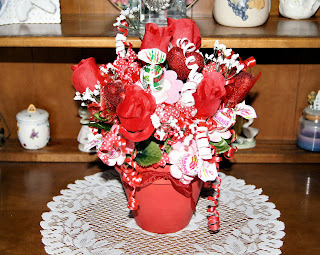 I'm having a BIG Val party in 2 weeks so I better get busy making this centerpiece...thanks for the inspiration! Please stop by & see what I've made so far..
Wow! Thats amazing how close your arrangement is to the painting. Your family is truly gifted. You and your son did a beautiful job! Great keepsake for years to come. This is gorgeous Leah! I love it!!! Holy Moley batman! This is fun, feastive, and yummy! Right up my alley! Who ever gets this will love you forever! So amazing how that worked out--thanks for sharing your story and project. Leah that turned out awesome! Now to keep everybody from eating the suckers, that will be a challenge. please post, please post, please post. Leah, this is awesome! I LOVE the flowers- SUPER pretty!!! Looks better than a real arrangement. Love the colors and how they pop. Your creation is great. Thanks for the idea. 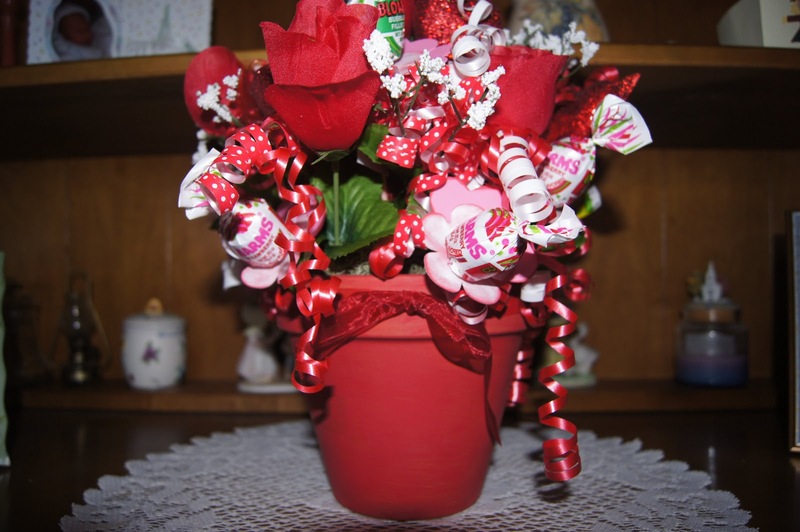 Your arrangement is wayyyyyyyyyy better! This is a stunning masterpiece, both of them. Love the fact that you craft with your son. I have 3 grown sons. When they were small we did a lot of crafting together and now they are grown men with a multiple ray of skills from making anything they want, cooking meals fit to feed a queen, and so on.. Love the arrangement and what a delight to hear the story about the painting. You have your grandma's talent. 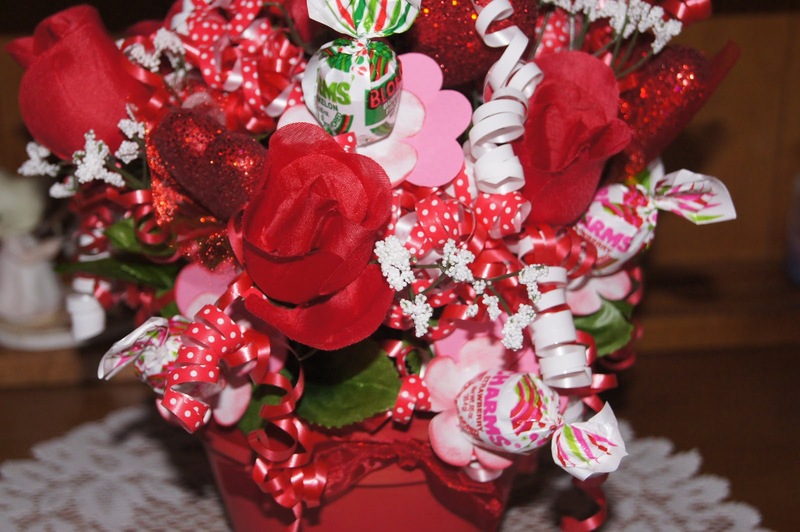 very cute bouquet! I love all the pics! My daughters LOVED this arrangement! The oldest wants to make one for the office at school! Thanks for sharing this great idea! It is beautiful! Wow, how beautiful. It looks so much ke the original. You go girl. OMG!!! This is one of the BEST flower centerpeices I have ever seen. You have inspired me and I am now your newest follower! !